Well, it’s that time of the year again. Or actually, it would be that time of the year in several weeks except that with the hot and extremely dry weather we had this summer, the garlic (as you can see from the photo) basically gave up the ghost and went ‘toes up’ (as we say here in the country) about 2-3 weeks early. We were trialing the two ‘winners’ from last year (Susanville and Vietnamese Red) against three ‘new’ varieties, Music (which actually we’ve grown before), Premium Northern White (which around here is the standard garlic grown by market gardeners) and Early Italian Red. Well, the growing season threw us and the garlic bulbs a complete fluke — hot and incredibly dry from the spring through frankly this weekend, when we finally got some concentrated rainfall for two days. Now, to review: The reason the DH and I have been going through all of this effort to try out different varieties of garlic is because sooner than later, we are going to become a market garden ourselves (yay, us!) and we need to find the best couple of varieties for our climate. 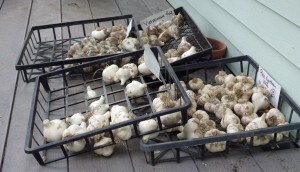 Now, the goal is to find enough garlic varieties which will get us a couple of early ones, a couple of mid-season ones and a late one to give us product coverage all summer. I was hoping the Early Italian Red would do the trick for the early one but… frankly, it started dying down only about 2 weeks before the others. And Premium Northern White crashed at the same time as the others (and I think the lack of water and the super hot weather did that). So, I ended up digging up everything at the same time to evaluate them. Cut off the stems and clean then up the next morning (I use a bucket of water and a 3M pad). Vietnamese Red: Planted 6.5 ounces of bulbs. Total Weight of cleaned bulbs: 4 lbs., 1.25 oz. Total Weight of cleaned bulbs: 3 lbs., 7.16 oz. Total Weight of cleaned bulbs: 3 lbs., 5.16 oz. Average Weight per bulb: 2.5 oz. Largest bulbs:1 at 4.16 oz. 4 between 3.5 and 4 oz. Total Weight of cleaned bulbs: 4 lbs., 9.16 oz. Average Weight per bulb: 2.2 oz. Largest bulbs: 4 over 4 ounces, 4 between 3.5 and 4. Total Weight of cleaned bulbs: 6 lbs., 10 oz. Largest bulbs: 5 between 3 and 4 oz., 17 between 2 and 3 oz. So, what is all of this telling us? 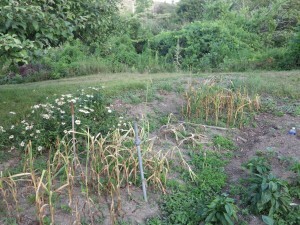 Well, it certainly is amazing how different garlic varieties respond to heat stress and lack of water. Early Italian Red (where we started with 8 ounces), produced more than 13 times it’s planting weight in bulbs. Now, 65% of them turned out to be small bulbs, but I opened several and there were no teeny cloves in the center (which is what I expected). It’s as if the plant’s message to itself was “Things are bad, but it’s better to have a few big strong cloves for survival rather than a bunch of little ones). On the other hand, if we want no little garlic bulbs at all, Vietnamese Red is the one to choose because from a 6.5 ounces vs. 8 ounces planted and what we got out of it, plus a more consistent product. We’ll have to do more studying on this. 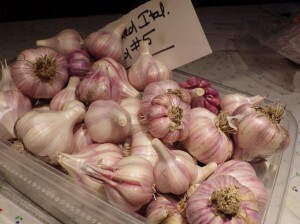 I’ve already ordered (if you haven’t ordered your seed garlic for this fall, hop to it because suppliers tend to get sold out by September) two new varieties to trial for next year: Elephant garlic and Chinese Pink (which is marketed as an ‘extra early’ type – heh, we’ll see about that). Something else of the ‘lightbulb’ fashion is this thought: Considering the hot and very dry weather we had, we actually did very well, much better than I expected. Why? Well, I planted all of this in early October, once we’d had a good stiff freeze. Between October 1 and March 31, we got 15.7 inches of precipitation. Between April 1 and July 31, we had 10.7 inches. One of the things I do is plant my cloves a lot deeper than is usually recommended. Usually, directions read to plant them 1-2 inches down. I plant mine as far as I can dig a hole with my hand – which is 6-7 inches down. I think, in terms of the amount of rainfall/snow we got (or rather, did not get), burying the cloves really deep helped them find deeper reserves of moisture. When I dug them up, the roots on most of them (especially on the larger ones) were 5-7” long. So, these cloves were sending out very aggressive roots to find moisture far, far below. Root veggies planted this spring, such as onions, have not done as well (unless given lots of water with hoses or sprinklers. I don’t think we’ll get any onions at all because we did not irrigate. –Shallots shallots There are many different varieties of shallots, this is just one. This will be another experiment for us; supposedly you break apart the shallot bulbs into ‘cloves’ just the way you do with garlic, so we shall see.